Nothing quite like Facebook to make us feel really clueless sometimes. The other day was one of those times. A friend posted about how her son had recently learned about the Donner family and their ill-fated trek from Independence, Missouri to California in May 1846. My friend engaged her son in conversation about it and he explained that they had frozen to death in the mountains. The teacher had opted to leave out the fact that they had engaged in cannibalism as a means of survival. 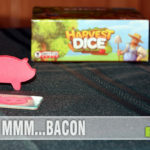 If you’ve ever played The Oregon Trail card game or computer game, you’re well familiar with the difficulties in succeeding. “You have died of dysentery” is a well-known phrase in pop culture, attributable to that retro computer game. Yet here I sat, familiar with the game (of course) and The Oregon Trail (the real one), yet unfamiliar with the story of the Donner family. Before you chastise me for not knowing such an infamous piece of history, I’ve never been shy in sharing my distaste for the subject of history in school. Side note: it’s a pretty morbid story so perhaps I subconsciously chose NOT to remember it. This whole ordeal will certainly make me look at games such as Gold West and Expedition: Famous Explorers in a whole new light. And if I feel like recreating the westward journey (sans the gory details), I’ll play The Oregon Trail board game from Pressman Toy. 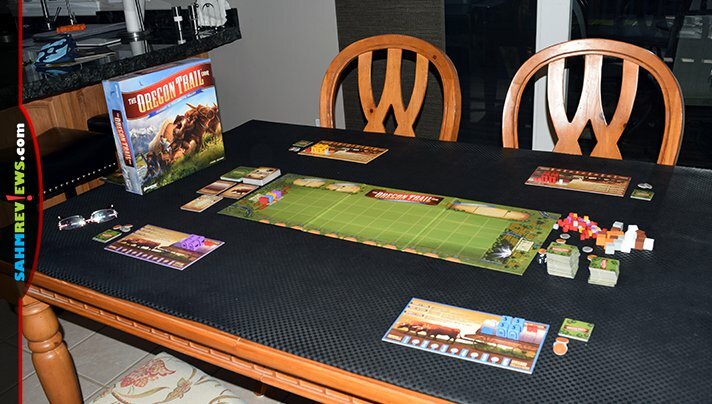 Developed by our friend, Daryl Andrews, The Oregon Trail: Journey to Willamette Valley expands on the concepts of The Oregon Trail card games. The goal of the game is to complete the difficult journey with as much money as possible to begin your new life. 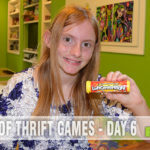 You’ll earn money along the way by gathering supplies, picking up hitchhikers and keeping your family healthy. Funerals will dip into your resources so you’ll want to keep your family alive… even if you’re tired of them after the long journey. 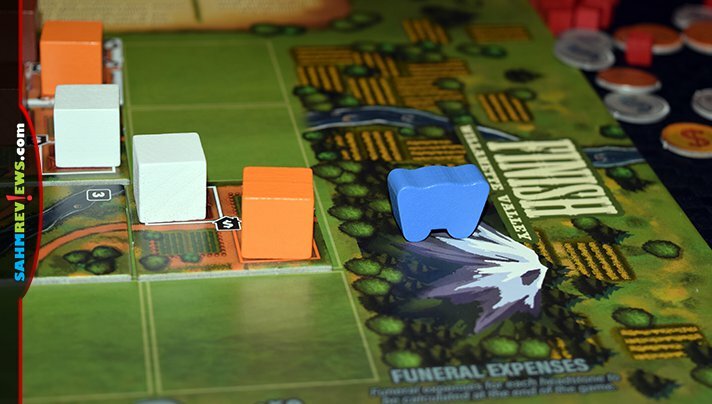 To set up the game, place the Willamette Valley board in the center of the table with supplies, hitchhikers and coins placed in community piles next to the board. Shuffle the separate decks of cards and trail tiles and create draw piles next to the board. Finally, have everyone select a colored wagon and places it in Independence, Missouri to prepare for the adventure. 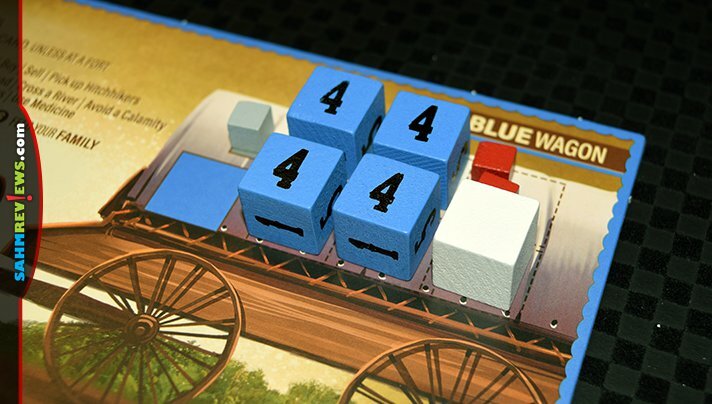 You’ll have your own wagon which is represented by the player mat matching the wagon you placed on the board. On the wagon, you’ll transport a driver, family members, meat, money and various supplies. The amount of people and supplies you can carry is contingent on the size of your wagon. The hunting targets on the bottom of the player mat will be used during your search for food during your journey. Good luck with that. 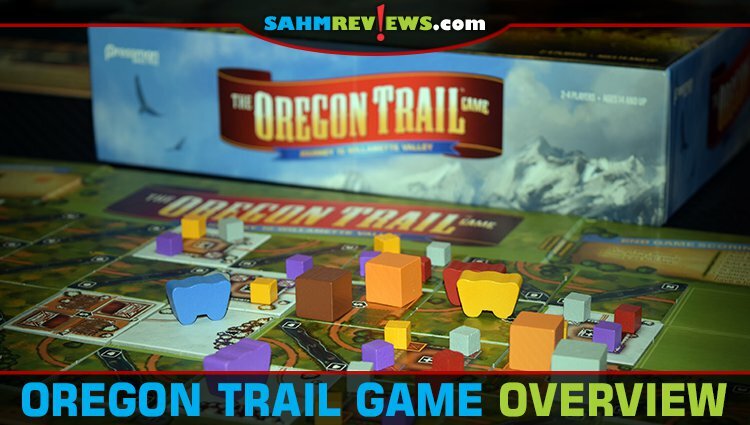 The Oregon Trail: Journey to Willamette Valley takes place over multiple rounds until either someone makes it to their destination or everyone runs out of trail tiles. You’ll get one turn per round but each turn consists of several steps. 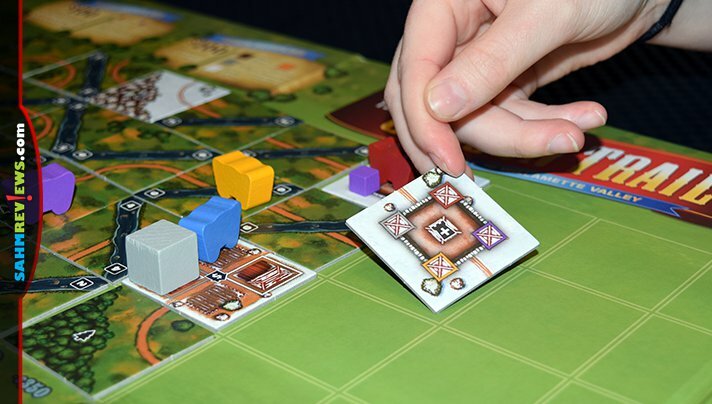 At the start of your turn, you’ll discover the trail by placing at least one of your trail tokens next to an existing space on the board. 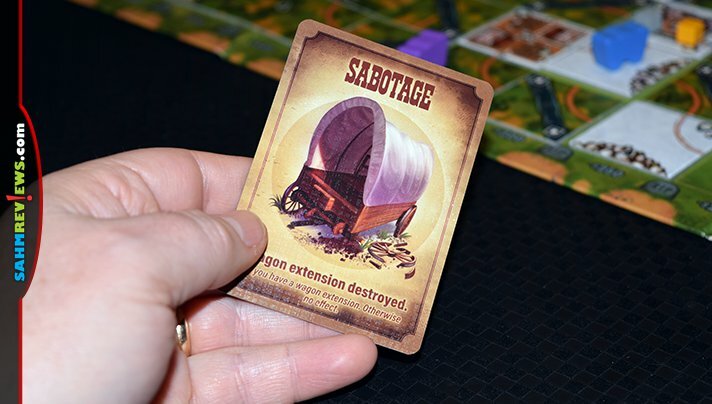 Next, unless you’re in the safety of a fort (or haven’t started your journey from Missouri yet) you’ll draw a calamity card… because what is a game about The Oregon Trail without some type of mishap to deal with? From there, you may take up to three actions that include moving, hunting, buying supplies, selling supplies or picking up hitchhikers. In addition, there are a number of free actions including crossing a river, trading, avoiding a Calamity, discarding supplies and using medicine to heal your sick people. While at a fort, you can purchase an extension to make your wagon larger or an additional ox to allow you to discover more land each turn. You’re also able to purchase any supplies or pick up any hitchhikers that are still available in the fort. Towns allow you to purchase smaller supplies and sell any excess you might want. Moving across the vast wilderness is painstakingly slow with each square costing a movement action. Of course, if you’re able to locate a road, you may follow it for as long as you like using the same action. If you happen across a river, you must decide if you’ll chance the crossing to continue your trek on this turn or end your turn and safely cross the river. You’ll begin your next turn on the other side of the river. Risking the river involves rolling a die. If you’ve rolled the river number or higher, you cross without incident. 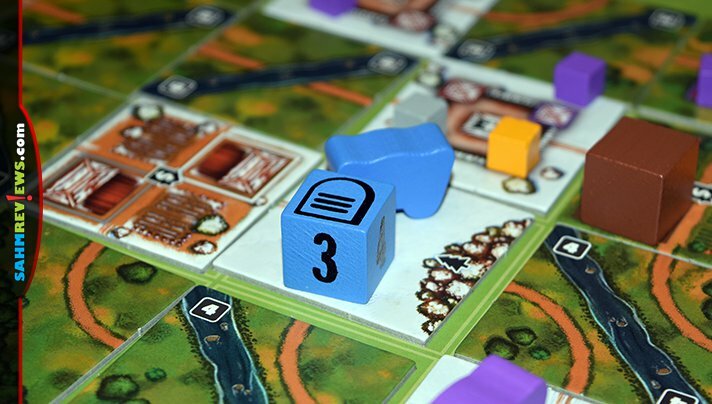 However, if you roll a number lower than the value indicated on the river tile then your family members are drowning and you’ll need to deal damage equal to the difference between the river level and the number you rolled. And we know that this journey isn’t quick so you’ll likely encounter winter along the way. Any time you enter a white winter tile, you”ll need winter clothes. If you don’t have them available in your wagon, each family member will take one point of damage and any hitchhikers will die immediately. As an action, if your wagon is on a tile with a tree, you can opt to hunt. After all, your family needs to eat! Another player draws the top hunting card from the deck and keeps it secret from you. Simultaneously, you’ll use your pistol and place it on a number on your wagon mat. If you have a rifle, you’ll place it on a target in between two numbers. Any numbers with pistols indicate where you are aiming while the numbers on either side of the rifle are where you’ve aimed. Once you’ve done this, your opponent reveals whether you’ve hit your target. If not, then you missed! After you’ve taken your three available actions, you’ll end your turn by drawing a new market price card if you made any sales. You’ll also resolve your calamity card and feed your family. If you are unable to feed them, they’ll each lose one point of health. At any point where a family member drops below one health, they die and their tombstone marker is left in the space where it occurred. When tiles run out or someone reaches Willamette Valley, the round finishes so everyone has received the same number of turns. At that point, you’ll lose money based on how far from Willamette Valley your family members were buried. 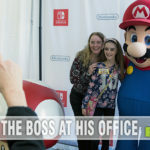 Of course, you’ll earn money for each hitchhiker transported safely to the valley and additional money for the health of your family members and driver. If you didn’t quite make it there, you’ll subtract $100 for each column you are away from the final destination. The person with the most money will be deemed the most prepared for prosperity in the new land. 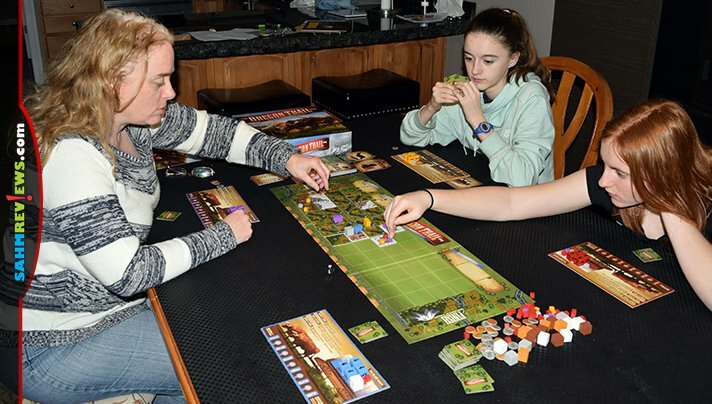 While our daughters like the cooperative aspect of the Oregon Trail card games, I personally liked the diversity of The Oregon Trail board game. You can play a fairly low key game (as low key as it can get when people drop like flies from dysentery) or you can make decisions based on making life difficult for your opponents. 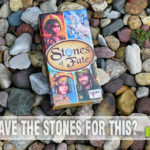 If you are a fan of the original video game, you’ll likely enjoy seeing it come to life on your game table. Copies are available at Target.com or on Amazon. See what else Pressman Toy is rolling out by following them on Facebook and Twitter. When was the last time you played The Oregon Trail video game? Oh I do remember the computer game when I was younger. This looks like a fun adaptation.